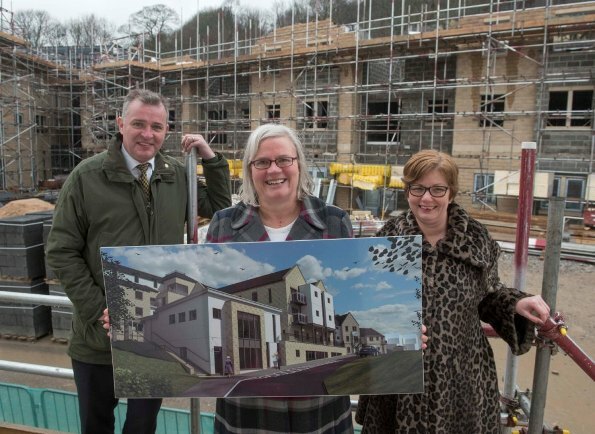 A new elderly care complex being constructed by charitable housing organisation The Abbeyfield Society is set to create about 60 jobs thanks to a funding package from Yorkshire Bank. The 84,000 sq ft facility which is being built on the former Bingley hospital site will offer 47 one and two bedroom extra care apartments, a 30-bed specialist dementia centre and a day care centre. The complex will also provide a central hub with coffee bars, lounges, restaurants and a hairdressing salon – all of which will also be open to the local community in addition to residents. It is expected that the facility, which is due to be completed in Autumn of this year, will create about 60 new jobs including care staff, nurses, catering staff, cleaning staff and administration support. The complex will also be seeking local volunteers who wish to donate their time and skills. The deal was delivered by Gail Fielding, director in health and social care, Yorkshire Bank’s Leeds-based Specialist and Acquisition Finance team. The Abbeyfield Society, based in St Albans, is an international charity celebrating its 60th anniversary this year. The organisation looks after about 8,000 people in nine countries including the UK where it operates 521 sites. The average age that service users access Abbeyfield care increased to 87 in 2010 from 65 in 1990. Jackie Bradfield, CEO of Abbeyfield The Dales, said: “We’re really looking forward to opening our new Bingley site. As well as offering fantastic high quality care services to the community we will have a positive impact locally in lots of other ways, from supporting new jobs to implementing a volunteer network that has the potential to enrich people’s lives. “We strongly believe in recruiting local people into local jobs to provide local services. People who join us will have the opportunity to develop their career and learn from our existing staff. We have one employee who started as a care assistant and is now a house manager and another who began in administration support who has been promoted to quality manager. Gail Fielding said: “It’s a great privilege to be supporting the work of The Abbeyfield Society, which provides vital care services to older people and enables our elderly to enjoy an improved quality of life in their later years.